Last month, a group of scientists from government, academia, and the private sector released National Climate Assessment, a report that outlines a disturbing list of potential challenges posed by climate change. The report suggests that future droughts and scorching heat will bring not only more wildfires to the Southwest but also withering damage to vital cash crops in the nation’s farming heartland. Meanwhile, torrential rains, damaging winds, and Sandy-type hurricanes are expected to drench, flood, and ravage the Northeast. The report concludes that if stringent policies are not soon put in place to curb greenhouse gases like carbon dioxide and methane, by the end of the century, sea levels may rise by as much as three to six feet (covering much of Southern Florida) while average temperatures could increase by 10 degrees or more. No matter your age—whether you are young and perhaps dreaming about a future life complete with family and career, or a senior wishing the same for your children and grandchildren—on hearing this report, you may have felt the same initial sense of helplessness and hopelessness that I did. The global climate-change problem is so immense, we are left to wonder if the early actions of government and the private sector will grow soon enough and meaningfully enough to make a difference. But, rather than sitting idly by, there are ways we can find right in our own homes to try to conserve energy and in small ways work as individuals to conserve our environment. Because modern livestock production is a major source of the greenhouse gas, methane, one way we can try to slow global warming is to cut back on our consumption of animal products, shifting instead to more plant-based complete-protein combinations. For a discussion, please see the last newsletter, as well as the recipes for plant-based, complete-protein combinations at the end of this issue. Another energy-saving idea, and our focus here, is to choose foods by their energetic “temperatures”—warming foods in winter/cold conditions, cooling foods in summer/warm climates. Aside from dressing appropriately for the season, we can use foods to help us acclimate to temperature extremes, thus saving on heating and cooling bills. There are many ways we can think about foods and use foods medicinally to our advantage. Foods have a taste or combination of tastes—sour, bitter, salty, pungent, and sweet—that affect different organ systems of the body. In addition, foods move energy in different directions within the body—upward, downward, outward, or inward, or a combination of these. Foods also have thermal qualities. Once digested, a food can exert either a warming, neutral, or cooling, effect. As a result, we can choose foods to tweak our own internal thermostat so we rely less on the thermostats mounted on our walls. So what foods are warming and which are cooling? At a barbeque smorgasbord on a hot summer evening, would you be best choosing a pork chop, a hamburger, or a chicken breast? What does adding salt do to the temperature of a food? Are any fruits warming? The answers might surprise you. Take the quiz below, marking in the space above each food either a W or H (warming; hot); N (neutral); or C, CD (cooling;cold). Then, check your answers using the table on the page that follows. 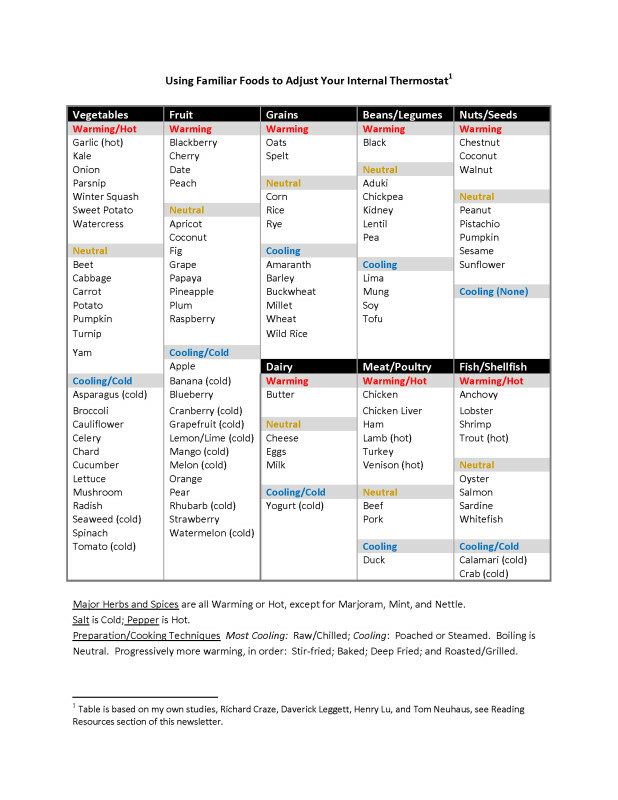 I hope this exercise helps to guide you in making wise choices –if you are always cold, to more warming foods; or, if you often feel too warm, to more foods that are cooling in nature. Vegetables: asparagus, broccoli, carrot, celery, garlic, kale, mushroom, radish, watercress. Hint: 1 is cold (CD); 4 are cooling (C); 1 is neutral (N); 2 are warming (W); 1 is hot (H). Fruits: apple, banana, blackberry, blueberry, cherry, cranberry, grapefruit, fig, pineapple, strawberry. Hint: 3 are cold (CD); 3 are cooling (C); 2 are neutral (N); 2 are warming (W). Meat/Poultry: beef, chicken, duck, lamb, pork, turkey, venison. Comments on the Table: If you don’t know and have to hazard a guess about the temperature of a food, a good rule of thumb is that most vegetables, fruits, beans and grains—in other words, most plant foods that are high in antioxidants and fiber and low in fat—are neutral to cooling. Conversely, meat and poultry, nuts and seeds, and dairy—foods that are rich sources of protein and fat—are generally warming. For vegetables, most bitter green vegetables are cooling, while sweet root and round vegetables tend to be neutral to warming. The majority of fruits are cooling, particularly those from the tropics, yet a few like blackberries and stone fruits like cherries, dates, and peaches are warming. Of familiar grains and beans, oats, quinoa, and black beans are warming, with most others either neutral to cooling. Dairy offers warming butter, cheese and milk which are neutral, and yogurt at the cooling end of the spectrum. Herbs and spices are generally warming to hot. Pepper is hot; salt is cooling. Conclusion: Yogurt and banana on a bone-chilling night? Perhaps….because, of course, the weather/season is just one consideration when choosing foods by temperature. If in winter you live in an over-heated apartment or work in an over-heated office, you may feel better with cooling foods. Or, if you are inherently either warm or cold by nature, weather and the season may be less of a deciding factor when choosing foods. If your body runs warm, you may feel best throughout the year with yogurt and citrus, bananas, and other tropical fruits. The key point is to understand that foods have thermal properties and that they can be used to your advantage, so try to eat in harmony rather than at cross-proposes with your biology and the seasons. If you are always cold or hot, check the foods you are eating to see if you want to tweak your diet. And, no matter the weather or the season, the right foods are the ones that make you feel your best. Above all, check in with how your feel. The following recipes from Diet from a Small Planet are simple, delicious, economical, and can be prepared in advance. They are flexible and can be adapted by your own creative additions. Pour boiling water over bulgur, cover and let stand until light and fluffy, about 2 hours. Shake in a strainer and squeeze out excess water. Combine bulgur with remaining ingredients and chill for at least 1 hour. Heat oil and sauté garlic, green onions, green pepper, and bulgur until bulgur is coated with oil and onions are translucent. Add beans, paprika, salt, pepper, cayenne, and tomatoes. Adjust liquids if needed. Cover and bring to a boil, then reduce heat and simmer until liquid is absorbed and bulgur is tender, about 15 minutes, adding more liquid if necessary. Mix water, milk, and honey and stir in buttermilk and oats. If using whole oats, refrigerate overnight so the oats can soften. Beat in remaining ingredients and cook on a hot griddle. For even better results, allow mixture to stand 1 to 24 hours. If batter becomes too thick, add more milk or water. Preheat oven to 425 degrees F. Stir together cornmeal, flour, salt, baking powder, and baking soda. In a blender, process tofu, eggs, oil, honey, and milk until smooth. Add to dry ingredients. Pour into a greased and floured 9×9-inch baking dish and bake for 25-30 minutes.